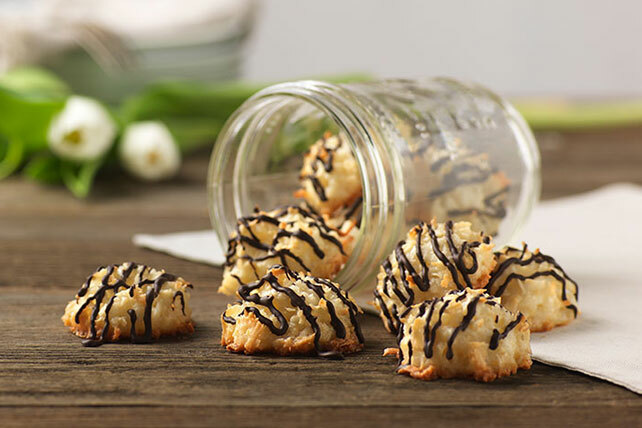 Be the talk of your next cookie exchange with our Citrus-White Chocolate Macaroons. Lemon zest makes these white chocolate macaroons extra special. Combine coconut, white chocolate, sugar, flour and salt in large bowl. Add egg whites, lemon zest and almond extract; mix well. Drop by tablespoonfuls, 2 inches apart, onto lightly greased and floured baking sheets. Bake 20 min. or until edges of macaroons are golden brown. Immediately remove from baking sheets to wire racks. Cool completely. Drizzle with melted chocolate.